I am one of two survivors of Tom Cook's Crew - 531st. I was reading an account of Keith M. Baker that is in spring newsletter (#42). I just wanted to relate that we did much of the same things except we flew straight to Mindoro without hardly any supplies whatever. We were the last crew to leave Fairfield, Lusan Base. It became Travis ATC base; I think it remains the same today. Don Jack (the other survivor) says he visited there and said our picture is on the wall there in their lobby. One other oddity is a picture of the Kingman boneyard. 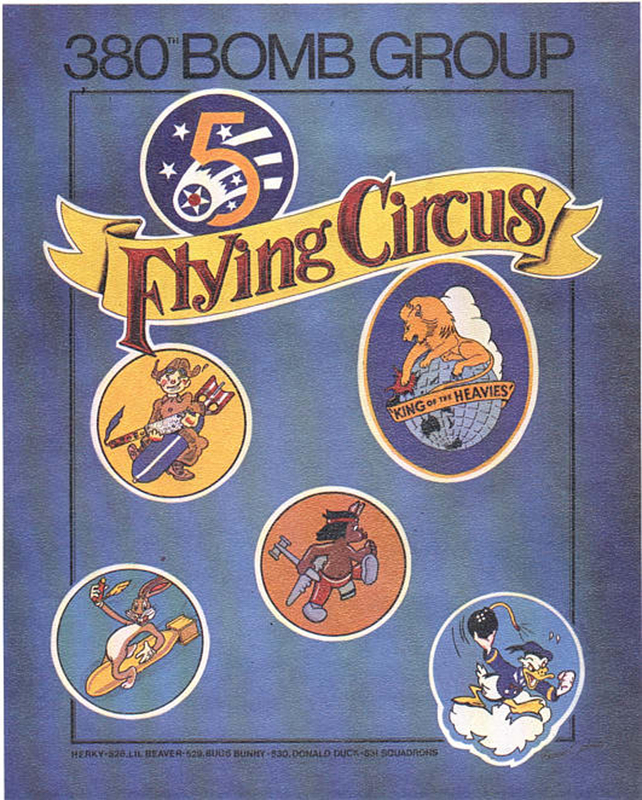 The next to last picture at the bottom of the page is one of a B-24 I flew my first mission on, "Chi Chi Baby." I see my ball turret being squashed. We (Don Jack and I) have obituaries and confirmed deaths of the remainder of our crew except for our tail gunner, Fred A. Barton - last seen in Milwaukee, Wisconsin. Anybody out there know? If you know anything about Fred A. Barton, please let us know! I finally got enough of my memories and opinions together to have a booklet put together. I have ordered 20 copies for my family, friends, and the 380th Bomb Group if you wish to have it for the archives. If you think there will be attendees at Branson who might be interested in purchasing one, please let me know, and I will send on more copies. I'm sorry that I cannot attend due to diabetic neuropathy. If you display the booklets, I have decided that I would sell them for $5.00. The Bomb Group would keep $2.50 for those you might sell at the table. Feel free to give my name and mailing address to anyone interested. I will sell them at $5.00 including postage. I probably won't get rich, but I had a great time writing them. In fact I have a few other memories that are floating around which could be an addendum. Let Barb know if you would like her to bring extra copies with her to Branson in November. Our organisation & museum are dedicated to all the Australian & American servicemen that helped keep this country free. Francis Seale flew out of North Australia during WW11 & was lined up for takeoff on 17th Jan 1944 when his B24 was struck by a returning B24 & the nose turret (named HAZEL) was torn off the B24. (pic attached). 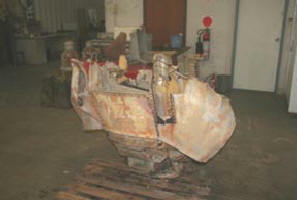 I have this nose turret & we are planning to mounting this nose turret as part of our B24 museum display. I'm hoping that our display will add a personal touch & remind us all that it was real people that flew these aircraft. Guess what--I found a "lost" 380 BG vet! I was out at Moffett Field today to see the Collings Foundation B-24 & B-17. There was an elderly gentleman sitting in a folding chair under the tail of the B-24 talking to folks about the B-24 and his exploits in the war (he was a B-24 pilot). He was wearing his A-2 jacket, with a 5th AF patch on the shoulder. 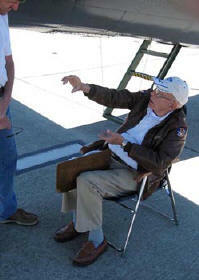 I asked him what outfit he had been with and he said the 380th BG, 530th BS. I introduced myself and told him about my father. I asked if he was a member of the Association and he said he didn't know there was one. I gave him the website address and my contact info. He gave me his card. He's interested in hearing from the Association. He is David C. Campbell, from San Mateo, California. I've attached a photo I took of him. I've got a correction and an addition to newsletter #42, Spring 2010. The pilot was or is Wilford Moran, 1st Lt, Buffalo NY. The navigator was or is 2nd Lt Chamberlain, St. Louis MO. The crew flew some 30 missions out of Mindoro. The picture of the B-24 on the back of the newsletter is of Moran's mission returning from Balikpapan, Borneo. Our airplane was flying above his. Shortly after the picture was taken we took flak and Moran suddenly turned east over water. Incidentally, my pilot was Erwin Greuel, deceased. 3 of us remain living. Radio operator John Katrincsak, West Mifflin, PA, and Victor Natale (Flight Engineer), Patchogue, NY. I have not had any contacts from any of the 380th Bombardment Gp about Samuel Millikin who went MIA on a B24 from the 529th Squadron. Not having a picture of Samuel hurt my inquiry, I believe. But now I'm back with another inquiry. My uncle's LST landed Aussie troops during the Tarakan and Labuan/Brunei Bay Borneo landings. I'm expanding the book that I wrote about my uncle and his shipmates into a oral history of the Borneo campaign. The book has the working title, Allies and Mates: the Australians and the Americans in Borneo. To that end I've contacted over 65 Aussie veterans from the AIF, the RAN, and the RAAF. One of them-Bob Mackie-was a bomb aimer on S/Ldr Cupper�s B24 A72-97 of the 23rd Squadron RAAF. Ray Cupper and a earlier crew flew with the 530th Squadron, 380th in October 1944 as did F/Lt Lex Halliday�s crew in the 530th plane 'Toddy'. I'm looking to contact any veterans of the 380th who worked with the Australians or who had flown bombing raids over Borneo in 1944 and 1945. I'm looking for their experiences and reminiscences. Please contact Steven if you would like to participate in his research. Greetings from Western Australia. I am writing to ask for your assistance with a historical project we are undertaking at Caversham near Perth, the State Capital. I am researching the history of what was known as the Fleet Air Arm Aerodrome Middle Swan which was constructed as a land-based airstrip for the Fleet Air Arm aircraft of the United States Navy and the Royal Navy in the defence of Perth. While the Japanese never attacked Perth directly and the inland airstrips were not required, it appears that the 380th Bomb Group used the airstrip, later known as the Caversham Aerodrome, as part of its pilot training at Cunderdin (also in Western Australia). You might have more information on this. However, after the war, the WA Sporting Car Club applied to use the airfield for a motor racing event aimed at raising funds for the Maimed and Limbless Ex-servicemen's Appeal. Named the Victory Grand Prix, it took place on Sunday 7th April, 1946 and 60,000 spectators streamed into the aerodrome to cheer the winner, Clem Dwyer. On 10th April, 1953 the WA Sporting Car Club signed a lease with the Commonwealth Government, allowing official use of the airstrip and grounds for motor racing. The Perth Gliding Club also leased a runway. The Government later took back the circuit to use a radio station for the RAAF base at Pearce. This effectively saved the site as it could not be developed. A few years ago, the radio base was decommissioned and it was found that the grounds were in "time warp" condition. The site therefore has great aviation and motorsport significance over here. As we move forward 50 years, today the aerodrome/motor circuit remains intact. The State Government now wants to use the land for a housing development and we are fighting to have it preserved. The reason I am writing to you is to ask whether you or your members have any information, photographs or reminiscences of their use of the Caversham facility which we can put forward in our submission to the Government to save it. I am putting a presentation document together and even a picture of a Liberator or a crew who was based in WA would be helpful. The track has great historical significance to Western Australians and I am sure that if we can have our voice heard in the halls of Parliament then we might just be able to save it. Please contact Graeme if you have anything that would be of use to him regarding the Caversham facility. My cousin Joe Chan (who came to the Tucson reunion) sent this. Thought it might be of interest to our group. Welcome new Air Force Retiree News Service subscribers! WASHINGTON (AFRNS) -- The remains of eight U.S. servicemen, missing in action from World War II, have been accounted-for and returned to their families for burial with full military honors, announced Department of Defense POW/Missing Personnel Office officials. The group remains of Lt. Jack S. M. Arnett, Charleston, W.V. ; Flight Officer William B. Simpson, Winston-Salem, N.C.; Tech. Sgt. Charles T. Goulding, Marlboro, N.Y.; Tech. Sgt. Robert J. Stinson, San Bernardino, Calif.; Staff Sgt. Jimmie Doyle, Lamesa, Texas; Staff Sgt. Leland D. Price, Oakwood, Ohio; and Staff Sgt. Earl E. Yoh, Scott, Ohio, and the individual remains of Lt. Frank J. Arhar, Lloydell, Pa., were buried April 30 in Arlington National Cemetery. The individual remains of Lieutenant Arnett and Sergeants Yoh, Doyle and Stinson were buried earlier by their families. On Sept. 1, 1944, their B-24J Liberator bomber was shot down while on a bombing mission of enemy targets near Koror, Republic of Palau. Crewmen on other aircraft reported seeing Lieutenant Arnett's aircraft come apart in the air and crash into the sea between Babelthuap and Koror islands. Two parachutes were spotted, but none of the 11-man crew ever returned to friendly territory. An aerial search was unsuccessful, and more thorough recovery operations could not be conducted because of Japanese control of the area. Divers from JPAC and the U.S. Navy examined the underwater site again in 2005 where they recovered more remains and material evidence. After safely stabilizing the underwater site, the joint JPAC-U.S. Navy team dived on the site again in early 2007 and recovered additional remains. The joint team returned again in 2008 and recovered more remains and evidence. The use of mitochondrial DNA analysis from the Armed Forces DNA Identification Laboratory, the biological profile of the remains, dental records, material evidence including machine gun serial numbers and identification tags of Lieutenant Arnett and Sergeants Doyle and Yoh enabled JPAC scientists to establish the identifications. For more information on the Defense Department's mission of accounting for missing Americans, visit the DPMO Web site at www.dtic.mil/dpmo, or call 703-699-1169.